What are the Georgia Guidestones? Summary: The Georgia Guidestones are a massive monument owned by Elbert County, Georgia. The monument is made up of 5 upright slabs of granite standing more than 16 feet tall capped by a horizontal slab. The base stones are inscribed with 10 controversial “guidelines” that some believe are principles which would guide a restructuring of a post-apocalyptic world society. The Georgia Guidestones are a massive monument owned by Elbert County, Georgia.i The monument is made up of 5 upright slabs of granite standing more than 16 feet tall capped by a horizontal slab. 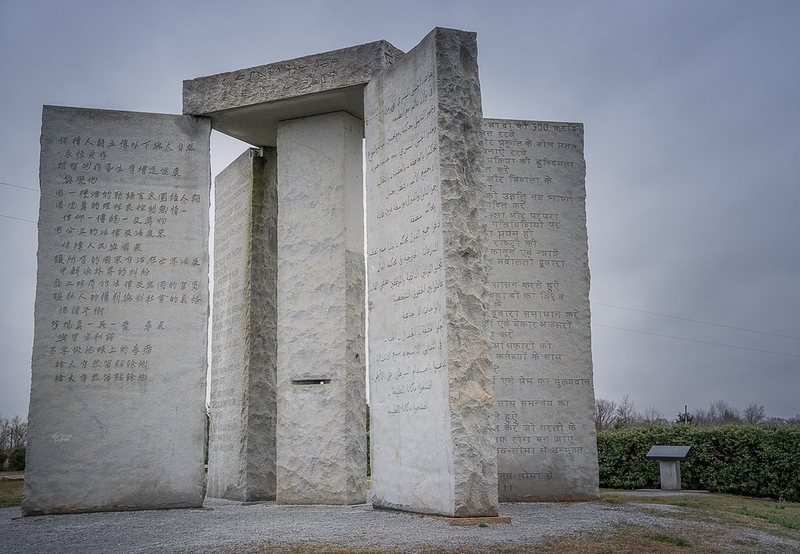 The base stones are inscribed with 10 controversial “guidelines” that some believe are principles which would guide a restructuring of a post-apocalyptic world society. Others believe the Guidestones to be the current goals of occult secret societies, and particularly the globalists engineering a new world order. No one knows for sure what the intent of the stones is since those who sponsored the monument have never been identified and therefore cannot be questioned. What is certain is that the mystery surrounding the stones is intentional. Wyatt Martin, then president of the Granite City Bank, was quoted as saying of the mystery man, R. C. Christian, who supposedly commissioned the monument, "All along, he said that who he was and where he came from had to be kept a secret. He said mysteries work that way. If you want to keep people interested, you can let them know only so much. "ii Aside from keeping people intrigued, the air of mystery about the stones would also serve to protect the designers from the wrath of those who oppose the message of the stones. Some have suggested that the whole thing is a hoax foisted on the public by local freemason businessmen who contrived the plan to bolster business.iii Elberton is a small town with a population of around 5 000. Before the Guidestones were erected, Elberton’s chief claim to fame was that it was, “The Granite Capital of the World.” It’s plausible that local businesses would be enriched by tourism dollars, had the monument garnered enough attention. An interesting feature of the stones is that they are precisely aligned with movements of celestial bodies. For instance, the North Star can always be seen through a hole drilled in the center stone. And on sunny days, a ray of sunlight shines through a hole in the capstone, falling upon the center stone every day at noon. Also, a slot on the center stone captures the sun during the solstices and equinoxes. These and other astrological features identify the monument with the occult. An inscription on a slab near the monument appears to explain the rationale behind it: “LET THESE BE GUIDESTONES TO AN AGE OF REASON.” The Age of Reason; Being an Investigation of True and Fabulous Theology, was a small book written by Thomas Paine, first published in 1794 for the mass market. The Age of Reason fueled the freethinkers of his day who rejected Biblical authority regarding truth, embracing a “truth” based on logic and empiricism instead. Paine taught that the Bible was not divinely inspired, but that it was a book like any other book. He endorsed “natural religion” based on Reason, rather than revelation. 1. Population control – the “optimal” global population is set at 500 million and selective reproduction is promoted. 3. Environmentalism – humanity appears to take a subordinate place below nature. •	What is to happen to more than 90% of the world’s population if 500 million is the number that makes “perpetual balance with nature” possible? •	Who decides what laws are “fair and just”? 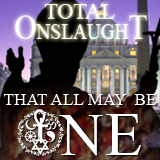 •	If faith and tradition are to be brought under the rule of “tempered Reason” what happens to freedom of choice? Watch ye therefore, and pray always, that ye may be accounted worthy to escape all these things that shall come to pass, and to stand before the Son of man (Luke 21: 34-36).